There's always room for another quality comic book publisher. Welcome to Vault Comics, the latest start-up to venture into the sometimes muddy business of sequential art books. Luckily, the new print is helmed by passionate people like Adrian Wassel, Damian Wassel, Nathan Gooden, and Damian Wassel, Sr. The new home for creator-owned science fiction and fantasy comics has allowed us a copy of one of their upcoming titles, Fissure #1, by Tim Daniel and Patricio Delpeche. The fissure in question is a gaping rupture of the earth in the border town of El Sueno, Texas, dividing an already divided community. A mysterious green gas emerges from the fissure manifesting in an unexplained supernatural phenomenon. At the center of the story are estranged lovers, pregnant Latina Avery Lee Olmos and the caucasian Hark Wright. They both seek advice from their respective parents. There's some conflict keeping them at arm's length and it's just one of the unsolved mysteries in this tale full of allegories to our real-life chasm between different racial, class, and income segments of society. One of the most interesting aspects for me was the use of Spanish in some of the dialogue. Whenever there's a foreign language it'll be translated with an asterisk describing it's origin. Daniel and letterer Deron Bennett let the Spanish dialogue stand with Avery answering in English to help give it context. You don't see that often but considering the setting, using the local language adds to the story's authenticity. And as a Latino myself I appreciate it even more. Patricio Delpeche lays out an incredibly well-paced story with a colorful pastel palette. His character designs are clean and crisp with plenty of detail offering various camera angles especially when things begin to rumble. The art is definitely one of the positives of the title so far. 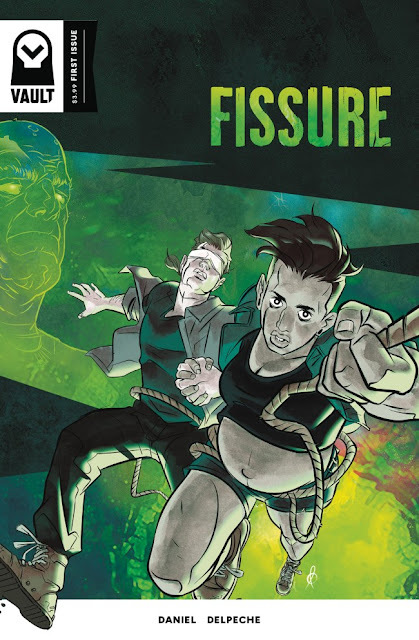 'Fissure' ushers in a new era for Vault Comics with a solid mystery that is driven by characters not solely action. Daniel's experience is on display as the dialogue is natural, the story involving, and Delpeche's art is first class. 'Fissure,' as well as Vault are the ones to watch in 2017.